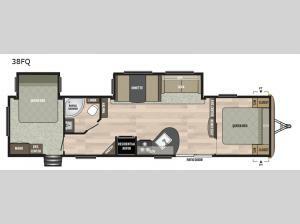 Spending time away from home will be easy in this Keystone Springdale travel trailer model 38FQ. This unit gives you TWO private bedrooms and some added sleeping space in the living area. The large slide out gives you plenty of walking around space while you cook all the family favorites. The storage in this travel trailer is perfect so you can bring whatever you want with you. There are two pantries, overhead storage, wardrobes, closets, and so much more! Come check out this model today!